It’s probably the most common skincare advice you hear: Sunscreen, sunscreen, sunscreen. With the risk of skin cancer constantly rising, protecting your skin from harsh UV rays is more important than ever, and no medical professional would tell you not to use it. But how does sunscreen work? Sunscreen prevents exposure to harmful UV rays that can cause damage to your skin. There are two kinds of UV rays: UVA and UVB, and both are harmful to your skin. In order to fight them, sunscreens use organic and inorganic compounds that are known to protect against UV rays, such as Vitamin E, Titanium Oxide and Zinc Oxide. When you’re going to purchase a sunscreen, you probably see the phrase SPF, or Sun Protector Factor, followed by a number. You may even see a number on some of your makeup products. But what does the number mean? The number, whether it’s 15, 30, 45 or more, stands for how much solar power it would take to produce a sunburn on your skin with sunscreen’s protection over if you had no protection at all. The higher the number, the more protection you’ll have. However, it’s important to note that SPF doesn’t necessarily mean that it is guaranteed to last all day. 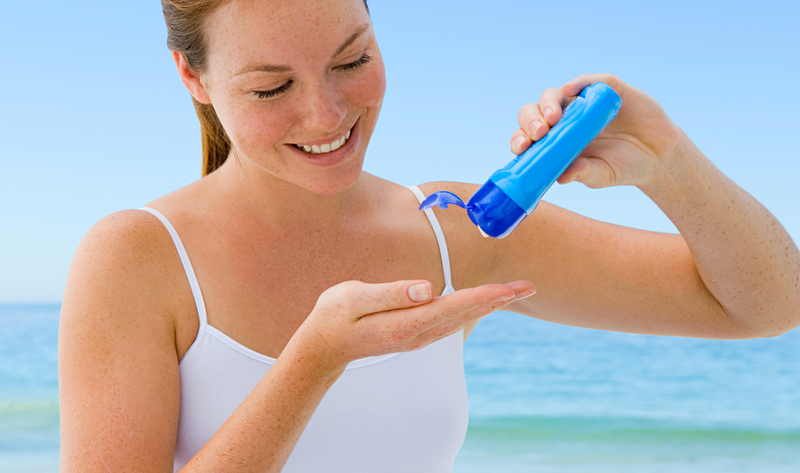 Most sunscreens protect you from UVB rays, or the rays that damage your skin through sunburn. Although it’s important to be protected from UVB rays, UVA rays are also damaging to the skin, particularly when it comes to the signs of aging. Studies have shown that UVA rays cause the DNA deep within the skin to change, thus heightening the chance of skin cancer. In order to protect against this, look for the words “broad spectrum” attached to your sunscreen. This means that your sunscreen protects from both. The benefits of sunscreen have been identified again and again, but there is one problem: Sunscreen also blocks the necessary Vitamin D your body needs in order to build and maintain healthy bones. In recent years, studies have shown that people have been developing deficiencies. Luckily, there is an easy solution: milk. Most varieties are now being infused with Vitamin D, and paired with the calcium, you should have no problem getting the sunshine vitamin in your diet, and you can still get the benefits of sunscreen. Apply your sunscreen about 15 to 30 minutes before you get outside, and then reapply when you get outside. Your skin needs time to absorb all the benefits. Cover up as much as you can with sun protective clothing. A large-brimmed hat, sunglasses and a sun umbrella can protect you from UV rays just as much as sunscreen. You need sunscreen for all weather, particularly if it’s cloudy. When it’s cloudy, the sun’s UV rays tend to be stronger, as light needs to be brighter in order to shine through. Darker-skinned women and those who love to tan may feel that they can go without sunscreen. Although you have a higher degree of protection, you are still susceptible to sun damage. However, you may not need much more than a basic sunscreen. When looking at an SPF, make sure you factor in your skin’s tone. Lighter skin needs much more protection, as it can burn much easier than darker skin. SPF 15 is good for most skin, but fairer skin can go to 30. Make sure to reapply your sunscreen if you are swimming or sweating, even if your sunscreen is a waterproof formula. Also know that if you’re doing any water sports, that water can reflect UV rays and make them stronger, if you’re doing this opt for a higher SPF. Seek out sunscreen formulas that are non-comedogenic, or don’t clog the pores. These may cause acne. If you’re also susceptible to rash, look for sensitive formulas, such as those for kids. Nothing should stop you from enjoying the sunny days ahead, so make sure to protect yourself! Is there any sunscreen that you recommend? Do you have any natural tips to prevent too much sun exposure? Sound off in the comments below!